The year has gone so fast! Lets go through some of the major points of 2014 and predict what 2015 has in store. In this post, I'll provide a step-by-step guide to perform interspecies gene name conversion of gene expression data. 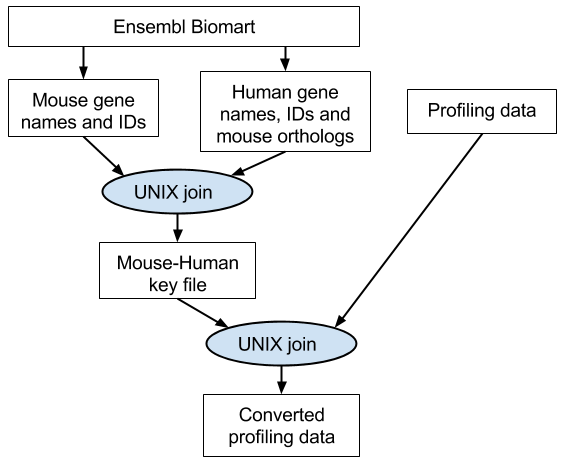 This is a necessary step in the comparison of profiling data from two different experiments with different species (human and mouse), and allows us to use extensive human-centric gene set libraries in MSigDB when analysing non-human mammalian profiling data (such as mouse). "1420647_a_at" "0.000346" "2.24e-08" "56.073665" "8.699524" "6.9755573" "Krt8" "keratin 8"
There is a need to make bioinformatics tools more user friendly and accessible to a wider audience. We have seen that Galaxy, GEO2R, Genevestigator and GenePattern have each developed a huge following in the molecular biology community, and this trend will continue with introduction of new RNA-seq analysis tools. 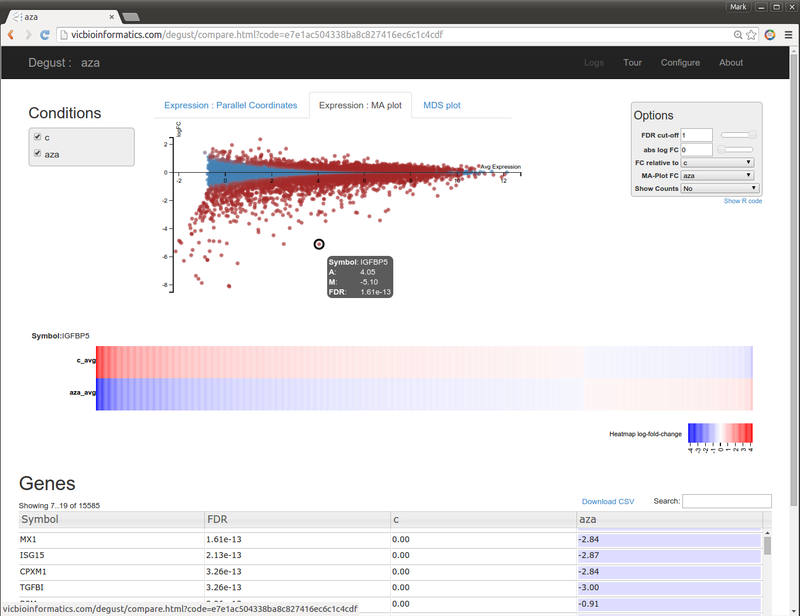 Previously, I posted about differential gene expression analysis of RNA-seq performed by the DEB online tool. In this post, I introduce Degust, an online app to analyse gene expression count data and determine which genes are differentially expressed. Degust was written by David R. Powell (@d_r_powell) and was Supported by Victorian Bioinformatics Consortium, Monash University and VLSCI's Life Sciences Computation Centre. In this test, I'll be using the azacitidine mRNA-seq data set that I have previously analysed. To make the count matrix, I used featureCounts. Alignment of microRNA to the genome poses a particular challenge because the reads are short, and some microRNAs are nearly identical. Moreover, microRNAs themselves are subject to RNA editing (adenine-to-inosine conversion, non-templated base addition) and normal sequencing error rates. In this post, I'm going to test the performance of several aligners in aligning microRNA reads to the Arabidopsis genome. I downloaded the Arabidopsis genome from Ensembl plant and the latest miRbase release version 21. I used bowtie2 to align the 325 full-length hairpin transcripts to the Arabidopsis genome. I generated pseudo microRNA reads that uniformly cover the hairpin transcript at a range of lengths from 16 nt to 25 nt. I then aligned the reads to the Arabidopsis genome using these different aligners with the default settings. I then used bedtools and awk to count the correctly and incorrectly mapped reads at a mapQ threshold of 10. In the past few posts, we've looked at RNA-seq aligner performance in terms of accuracy and speed. In this post, I'll take a look at the accuracy of DNA aligners using simulated reads. The first step is to download the genome of interest. 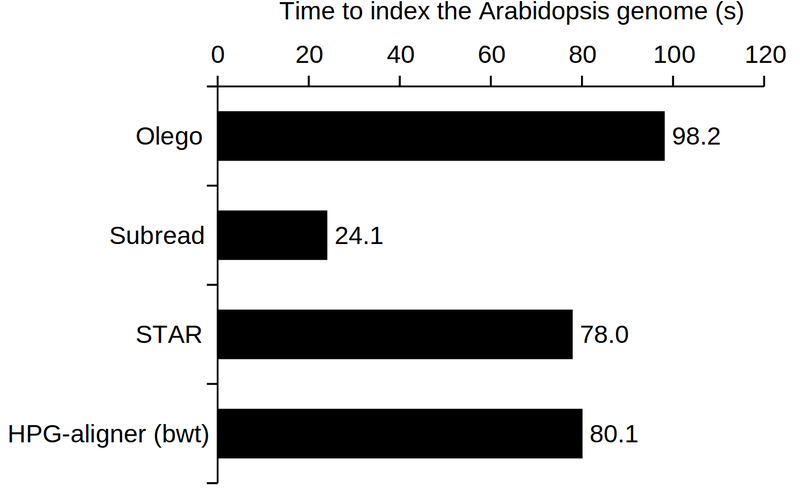 I'm using Arabidopsis as its pretty small and good for quick benchmarking. I downloaded the genome from Ensembl plant ftp site (link). Next step was to generate simulated reads that uniformly cover the genome at user-selected length and intervals. I couldn't find any previously made simulators to do exactly that, so I chained together some awk and bedtools commands (code at the bottom of the post) to generate the reads. I generated pseudo reads of 50, 100 & 200 bp in length at 10 bp intervals and output them in fasta format. Here is an example. 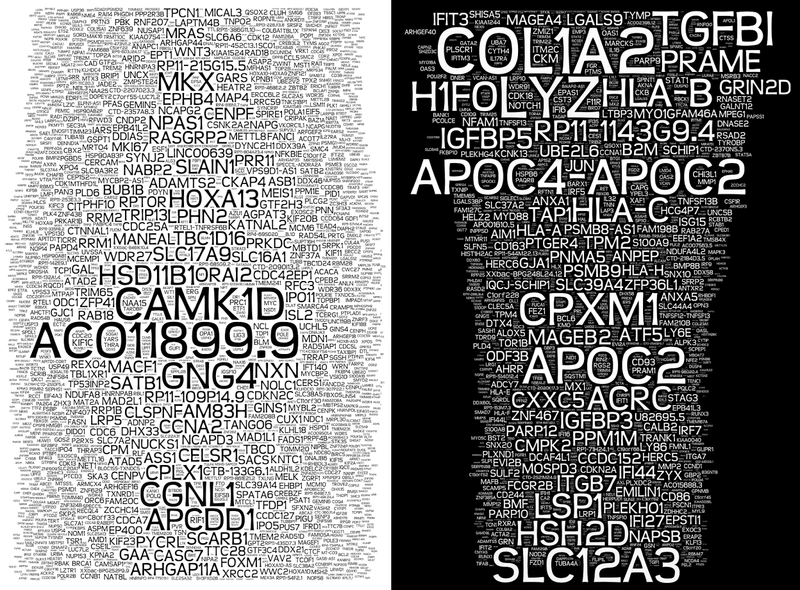 You have probably seen word clouds before - but have you tried with gene expression data? Now go to the "advanced" tab of the Wordle page and paste in the data. Experiment, with the colours, layouts and be sure to increase the "maximum words" to get a real appreciation for the number of changes in your experiment. Here is an example I made using both the up and down regulated gene sets showing the effect of azacytidine on AML3 cells. The result is pretty amazing. In the previous post we looked at how choice of RNA-seq aligner influenced results. 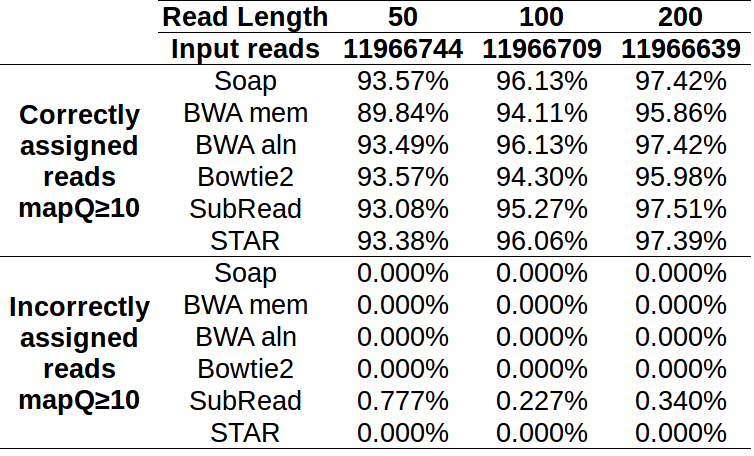 In this post, we'll use simulated reads to empirically determine the accuracy of OLego, STAR, SubJunc and SubRead. If you like science, you will love Forty-Four and Two. A new blog that delves into genetics and molecular biology for the wider audience. His latest post is an impressive poster describing some data we published together earlier this year in CMLS. Keep up the good work! In the previous post, I compared the speed of several RNA aligners. In this post, we'll take a closer look at the results generated by these different aligners; Subread/Subjunc, STAR, HPG aligner and Olego. 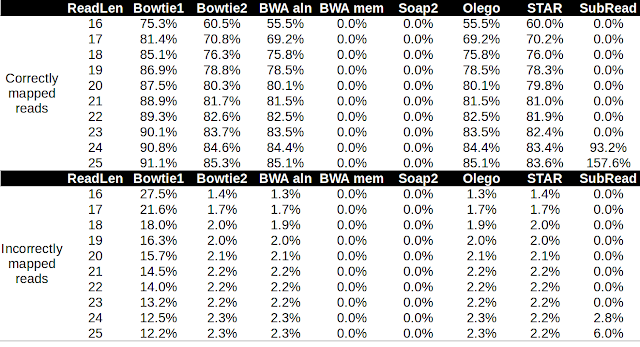 In addition, we will use BWA MEM as an example of what happens when you use a DNA aligner to analyse RNA-seq. For the test, we've been using 101 bp Arabidopsis mRNA-seq data from GEO accession GSE42968. For simplicity, I use only the forward read in the paired-end dataset. I used fastx-toolkit to remove low quality bases from the 3' end (base qual threshold of 20). One of the simplest ways to assess the quality of an alignment is to determine the proportion of reads that are mapped to the genome and the proportion that map to exons. 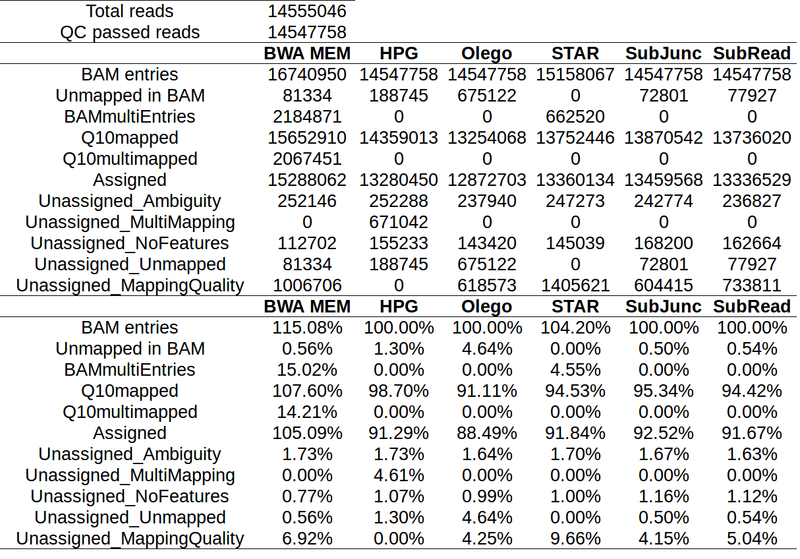 After the aligners did their work, I used featureCounts to quantify the number of aligned reads with a mapping quality >10. 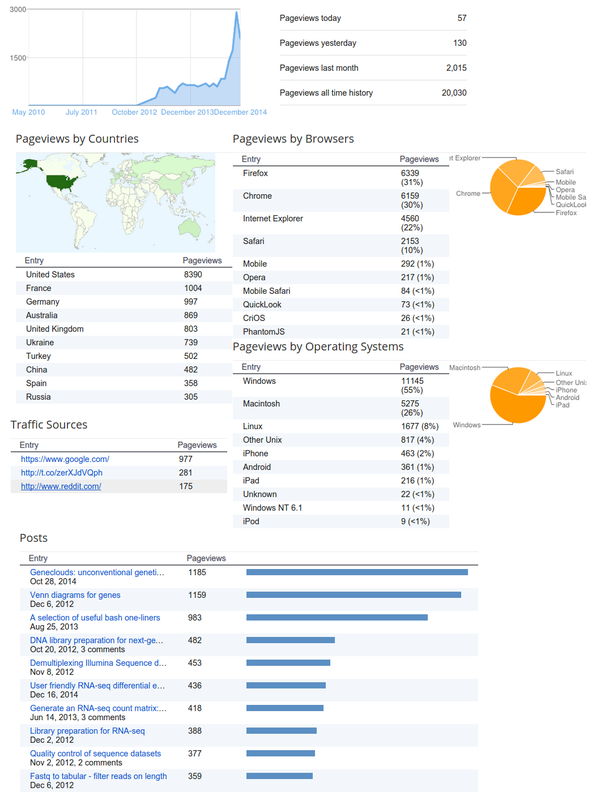 Here is the data for the first sample in the series, SRR634969 which contained 14.5 million reads. In this post I compare the speed of Subread/Subjunc, STAR, HPG aligner and Olego. I will use real RNA-seq data from GEO accession GSE42968 and align to the Arabidopsis thaliana genome. All code used is found at the bottom of this post. The benchmarking was performed on a standard 8 core workstation with 8 GB RAM. Index the Arabidopsis thaliana genome The first step in any RNA-seq analysis is to prepare the genome for alignment. Subread was the quickest.